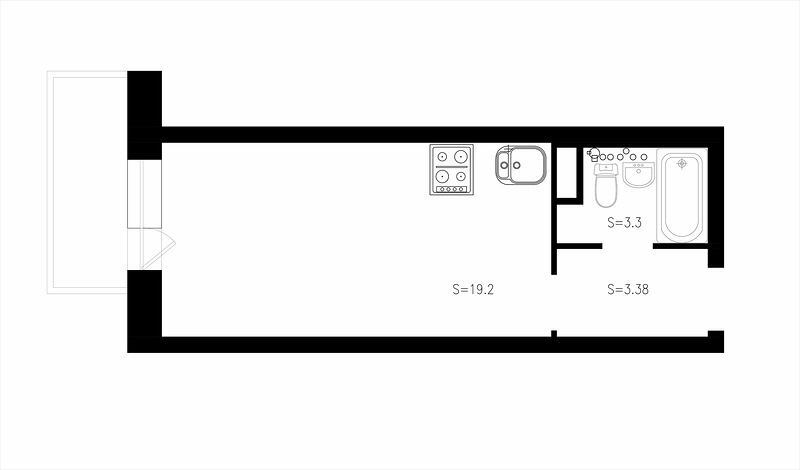 What are you supposed to do if you’re a “lucky” owner of an extremely small dwelling, which is shaped as an elongated narrow rectangle to crown it all? The interior we’d like to show you today will convince you that small space is not that bad when treated with much attention for every inch. 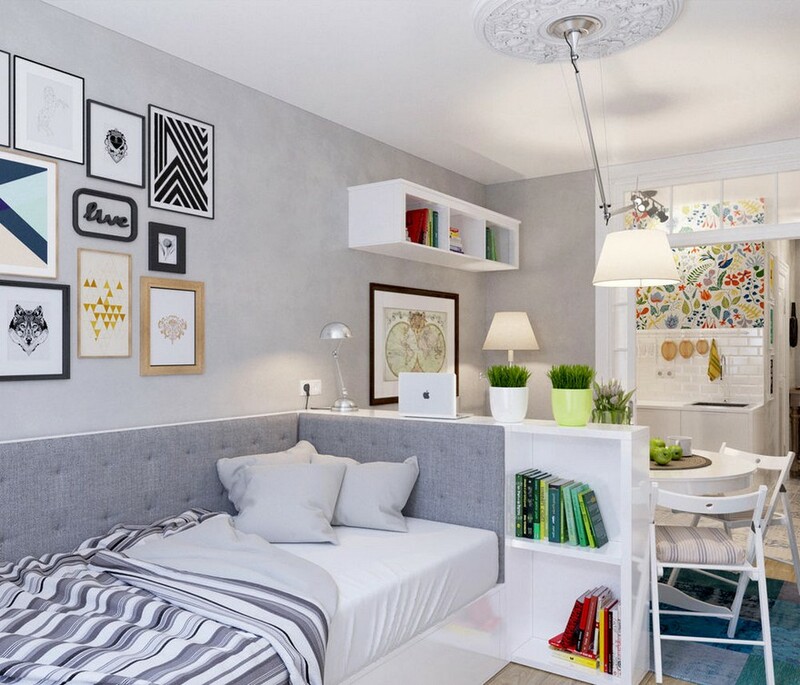 This studio apartment located in St. Petersburg was assembled as a Lego model – according to a well-thought-out scheme and step by step. 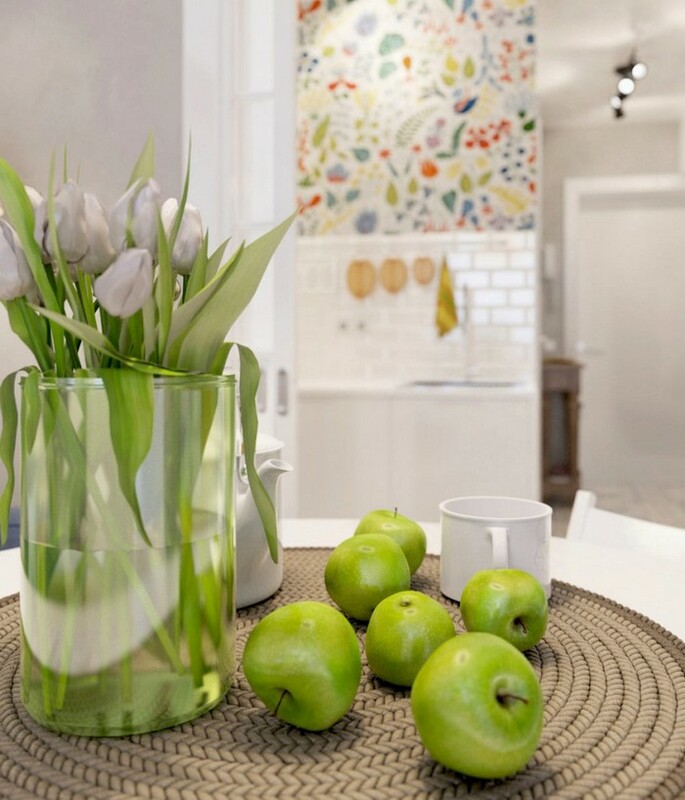 Otherwise, it wouldn’t be possible to find room for a full-fledged kitchen set, a separate dining area with a couch, a bed and a big closet within just 25 square meters. So, let’s have a look at the details and learn the story of this flat step by step. This apartment belongs to a woman, a medical doctor by profession. She lives alone, but sometimes her grown-up children come to visit her and stay for a night. The hostess’s general wish was to have a space for good rest that would include all the essential areas for full-fledged living and would neither remind of a pantry or her white-walled job office. These are the rooms where serious mathematical challenges begin. 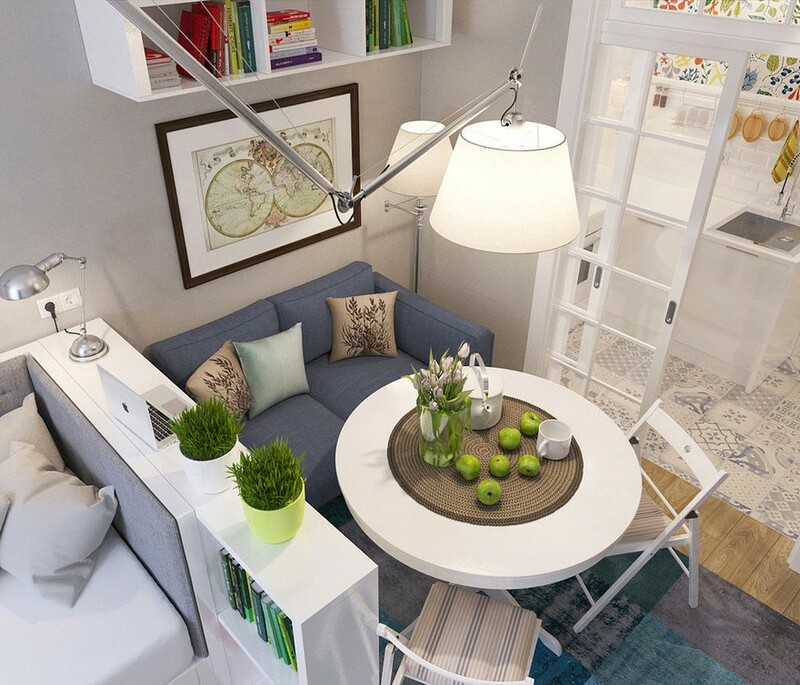 The kitchen and hallway occupy the total area of just 8 square meters – not so much, you’ll agree. 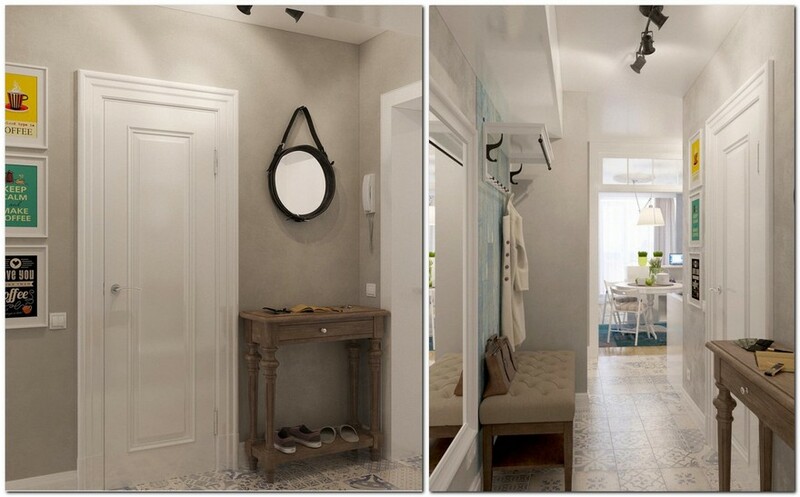 That is why the hallway was equipped with a big ceiling cabinet, a shoe and a coat rack and even a bench – this is a complete list of must-haves for convenient dressing and storing seasonal clothes. The kitchen set is L-shaped. The bottom level includes a convenient corner cabinet with a special drawing mechanism. Top cabinets are arranged on just one wall, but they are very roomy and built up to the ceiling. 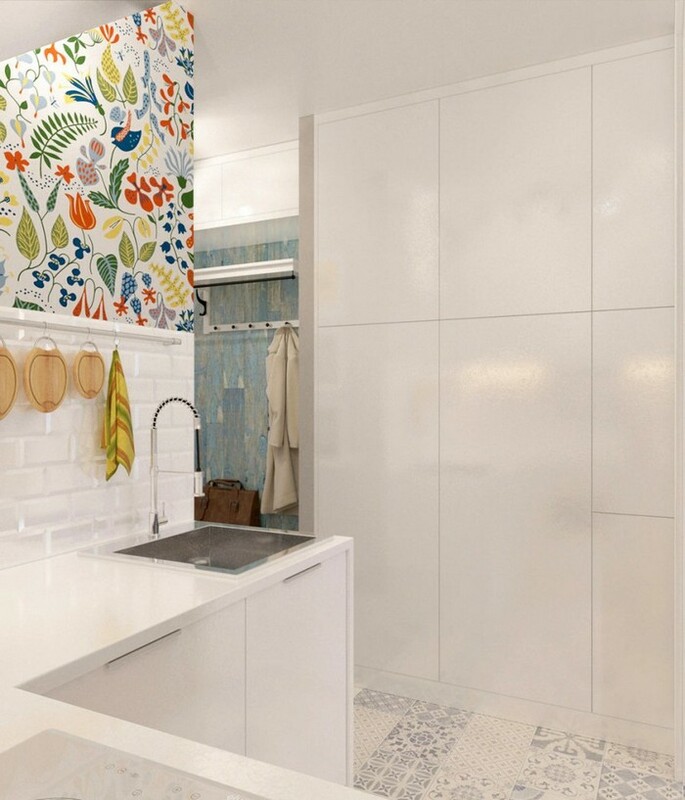 A refrigerator is concealed in a closet opposite the kitchen set; this construction is so well-thought-out, glossy white and with no extra details that it makes it almost invisible. This is the main spot for storing household stuff, including a vacuum cleaner and an ironing board. A twin brother of the kitchen cabinets can be found in the living room. Located by the window and custom-made according to the designer’s sketches, it plays a role of the main storage area. 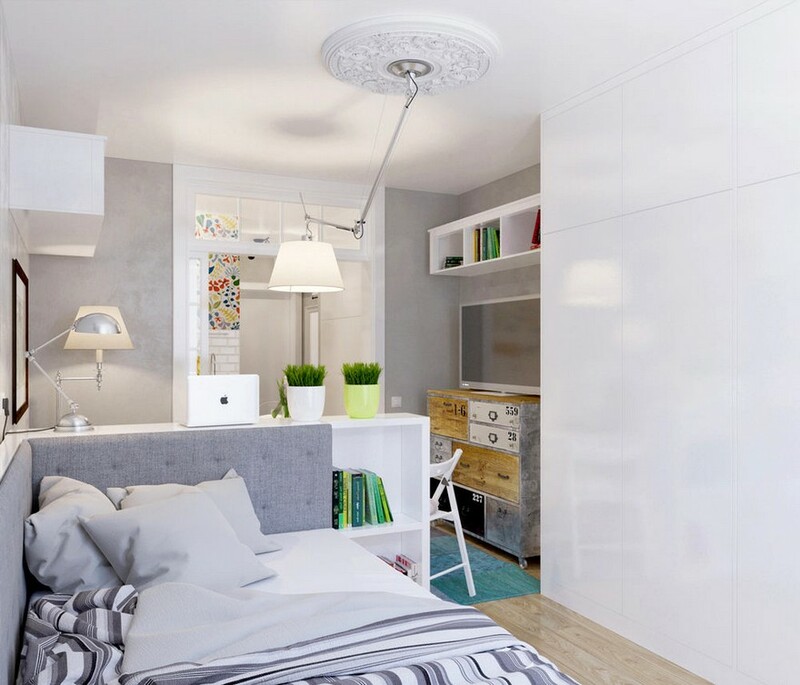 Extra storage space is provided by a chest of drawers under a TV-set and wheeled storage boxes under the bed. Dining and sleeping areas are separated with a low shelving unit for books and other small things. Both the table and the chairs are folding, made by IKEA. 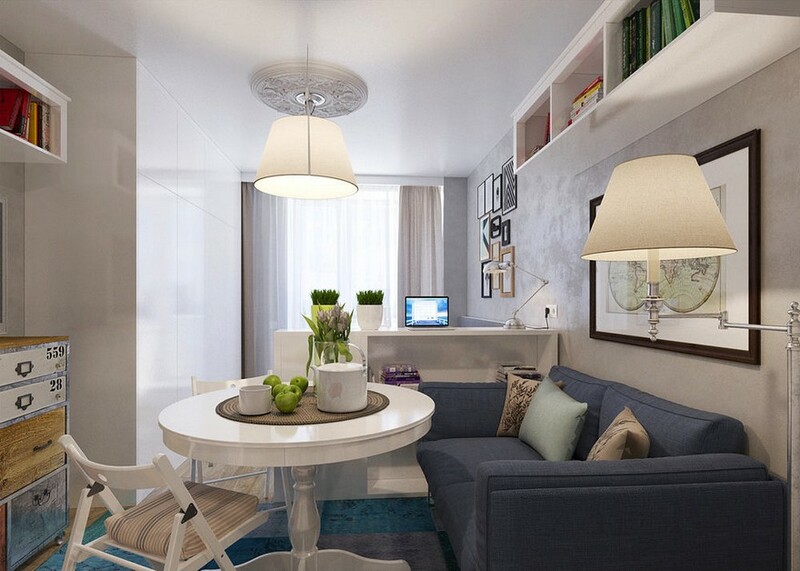 The idea of utmost rationality is efficiently supported by well-thought-out lighting system. To provide a long narrow room comprising different functional zones with enough light the author of the project chose a big pendant lamp with a flexible lighting arm that makes room for customized height and angle of lighting. This is a Tolomeo Mega model by Artemide, Italy. The lampshade of a big Italian floor lamp by Bella Figura (SL14 model) is also rotatable. 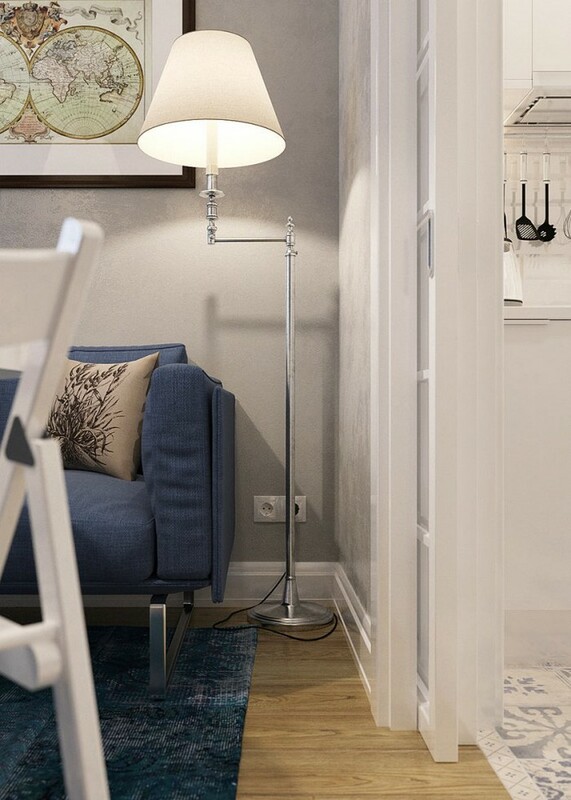 The lampshade of a big Italian floor lamp by Bella Figura (SL14 model) is also rotatable. 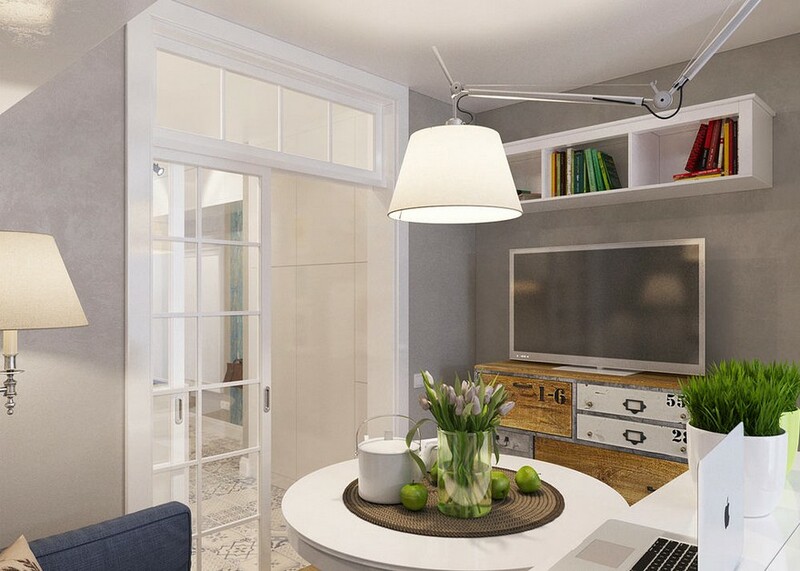 In order to do without “hospital” white colors in the private life of the doctor and meanwhile preserve the elongated narrow room as light and airy as possible the designer set his choice upon light grayish blue shades. Such a color scheme creates a perfect minimalistic background for large-scale pieces of furniture. 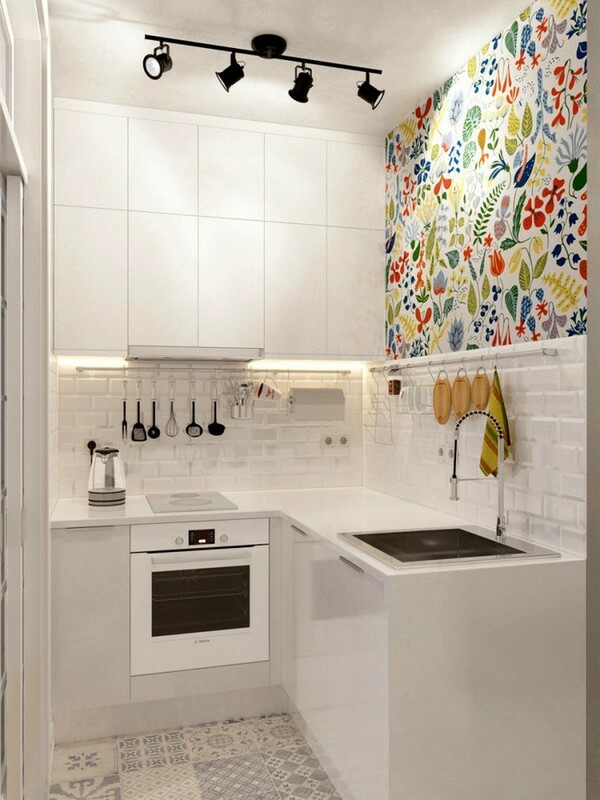 And Swedish Wallpapers by Scandinavian designers with a bright floral pattern on the kitchen wall creates the impression of an exotic piece of art, which brings life and a splash of color to the pastel interior and links all the functional zones visually. 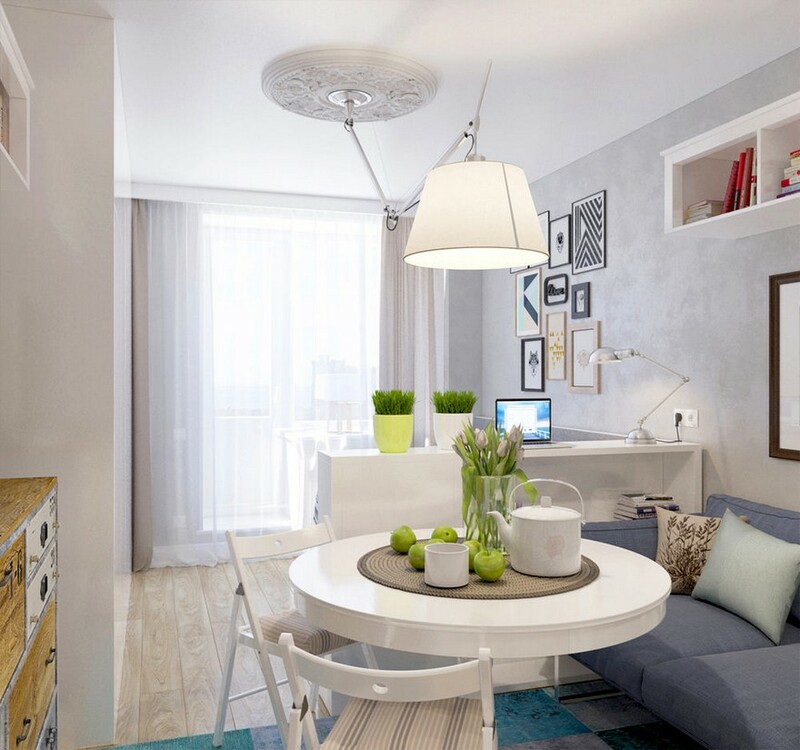 So, you see – a one-room apartment, even with such a dramatic layout, is not a sentence – it’s just an interesting challenge!